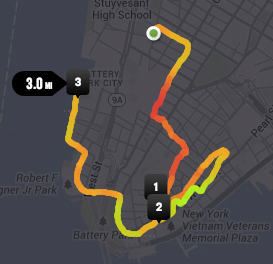 Every year, the New York Road Runners have very few evening runs. Most of the races are on Saturday and Sunday mornings, predominantly in Central Park. One of the rare, annual exceptions is the American Heart Association Wall Street Run, which runs the streets of the lower tip of the island of Manhattan. The Wall Street Run attracts many casual and non-runners. 1,300 people from Citibank alone were at the start line before the race. Unlike most races, there were not specific corrals, but people were told to line up near the signs for the pace that they expected to keep. Unfortunately, since many of the runners were not of the type who would know their pace or care about it, people just moved towards the start line en masse in anticipation of the start. The only advantage of the race’s start was that the people walking the 3 miles had a separate corral, which made me think of zombies because of the signs that said “walkers” around their pen. When the race started it was 89 degrees out and the heat was a direct opposite of the cold, rainy days preceding it. With the horn blowing, we were off, but the narrow streets and runners of disparate paces made for a slow start to the run. Small hills going up and down as we made our way through Warren St, Church St., and Liberty St. My first mile was ten minutes and I was able to start picking up some speed around that point. At about the halfway point was a water station to help us from overheating. As I grabbed a paper cup full of water and kept moving, my pace kept increasing. As I looked down at my GPS watch, it said I was running about 6:30 per mile. I couldn’t believe I was running that fast at that point, but I was feeling good and kept it up, even dipping below 6 minutes at one point. I continued to push myself as we moved through the windy path laid out for us to run that day. I was able to maintain pace between 6 and 6:30 for the rest of the race, offsetting the ten minute first mile. When all was said and done, my final time for the three mile American Heart Association Wall Street Run was 24:28, with an average mile of 8:10, which beat my previous PR by 1 second. I was fairly proud of being able to beat my PR, even if it was just by a second, having not run since my foot pain during the Brooklyn Half Marathon. With training begun for the 2013 Chicago and NYC Marathons this week, I look forward to seeing how much better I can do during races this year by running with my team and having my foot healed.